This page will list and describe some of my favorite local hikes, along with stats, maps and pictures. The majority of these will be in the western portion of the Santa Monica Mountains, in the areas known as Rancho Sierra Vista/Satwiwa, Rancho Potrero Open Space, and Pt. Magu State Park. I am fortunate to live near so many of these amazing trails, but they are all within about an hour's drive of downtown Los Angeles. I hike often, if you're in the area, let's Hike Alone Together. One quick note. 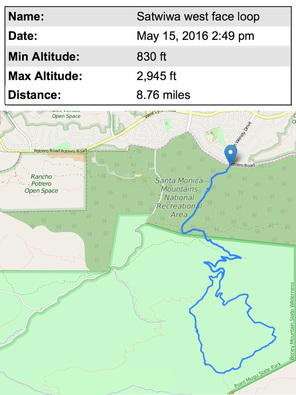 By clicking on the greenish trail map supplied for each hike, you will be taken to the MotionX GPS website view of the hike, with a more detailed and scaleable map. I highly recommend using a trail map app when hiking, it's fun to keep track of your hikes, it keeps you from getting lost, and you can even send location updates to your daughter who worries you'll stumble on a rock, crack your head open and require some ER attention. More on that hike, affectionately known as 8 Staple Hike, soon. There's several good hiking apps available. I've used this one for several years. Now on with the hikes! 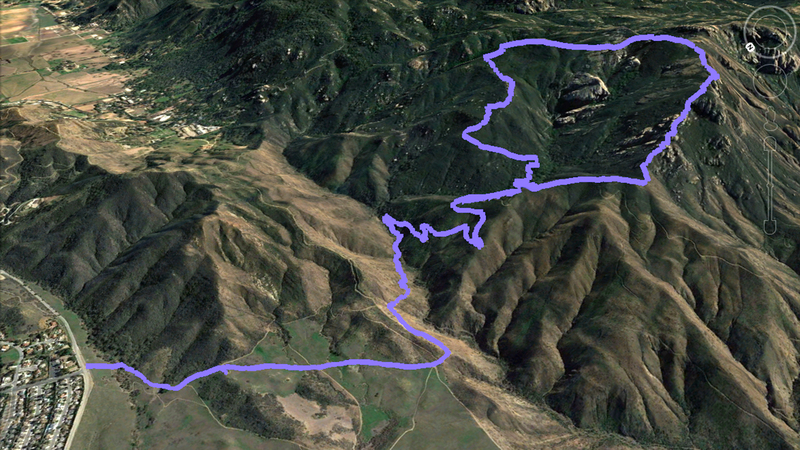 5 miles out and back, total ascent of 1000 feet, moderate hike, with a little uphill scramble at the end. 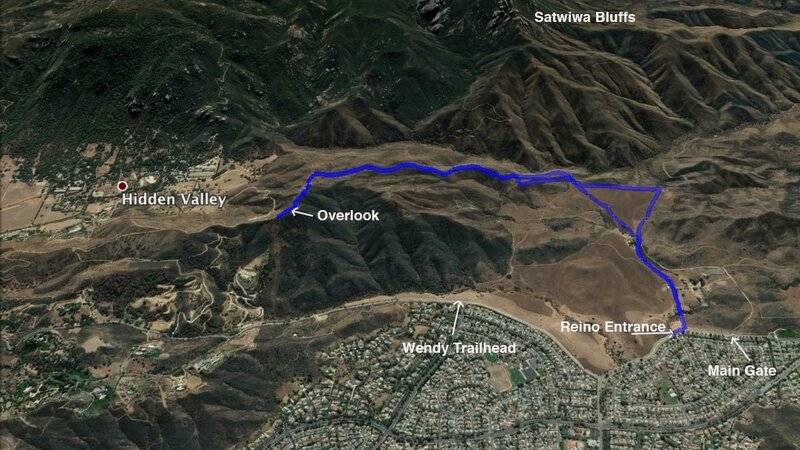 From the overlook, great views of the park and back toward the Conejo Valley, as well as of course, Hidden Valley. Great for a handy but rigorous and healthy hike. Click on these stats for link to MotionX GPS data and map. Click 'play' for auto slideshow, manually advance, or scroll through the thumbnails. Click on each individual picture to open a tab/window with full size image. It's not often the falls has much water, though it's always a pleasant hike to rocky and lush canyon, even when there just a trickle. Park at Wendy Trail head for the fastest access to the best path. 9.6 miles. total ascent of 1,440 feet. 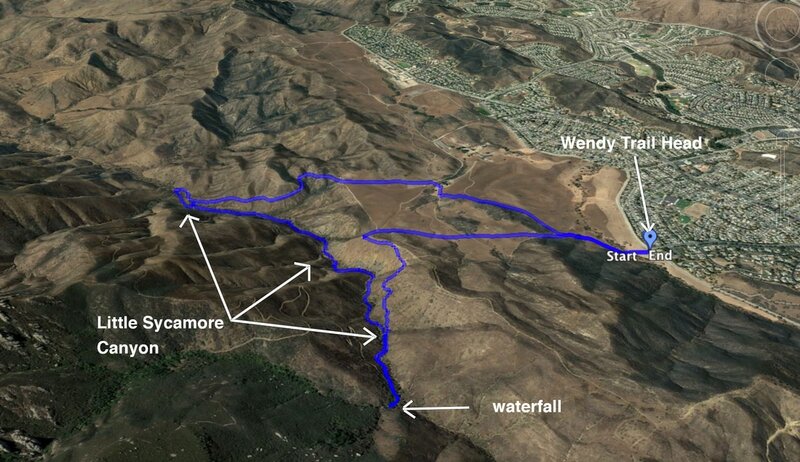 I wanted a vigorous long hike, but because of the muddy trails, stuck to the well maintained Sycamore Canyon road and the more rustic but paved, Ranch Center Road. I also was curious if, after the recent rains, our Hidden Pond actually had water in it, something I hadn’t seen a couple previous visits. ​The plan was to hike the 4.5 miles to the backside of the Hidden Pond trailhead and then proceed if it wasn’t too muddy. If too muddy, it would still be a long beautiful hike. You can see the results in the slide show and maps below. If you know you will be back before sunset, use main parking lot, Other wise park on Reino Road. or at the Wendy Trail Head. 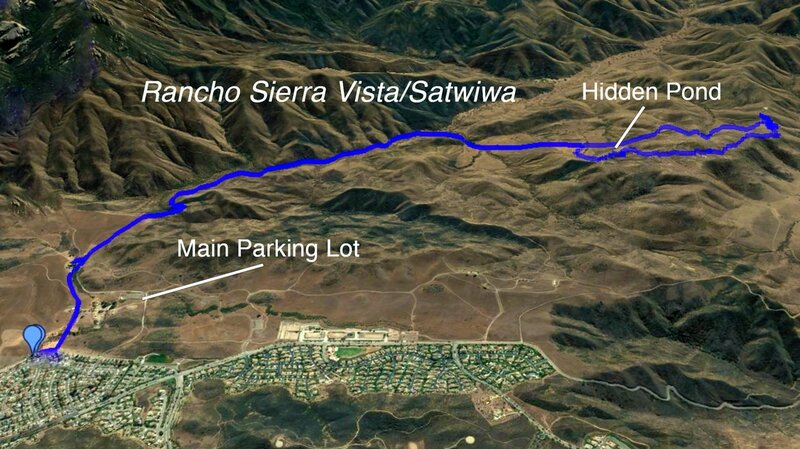 For the past three years I have hiked in the shadows of a magnificent set of bluffs above Sycamore Canyon, an area known to the Chumash First Nation people as Satwiwa, which is the Chumash word for bluffs. Because these bluffs face west, they are particularly beautiful in the late afternoon sun. Though I had hiked to their peaks a few times using trails up the backside, a trek up the west face was calling me. I found and followed the Western Ridge Trail, a spur off of Old Boney Trail, which winds up through the rocks to the top most peak. Stunning views all the way, as you can see in the slide show below! From the Wendy Drive trailhead the hike is about a 9 mile loop. Though more strenuous than most hikes in the this area, involving some rock scrambling - though not rock climbing - near the top, it was well worth it. 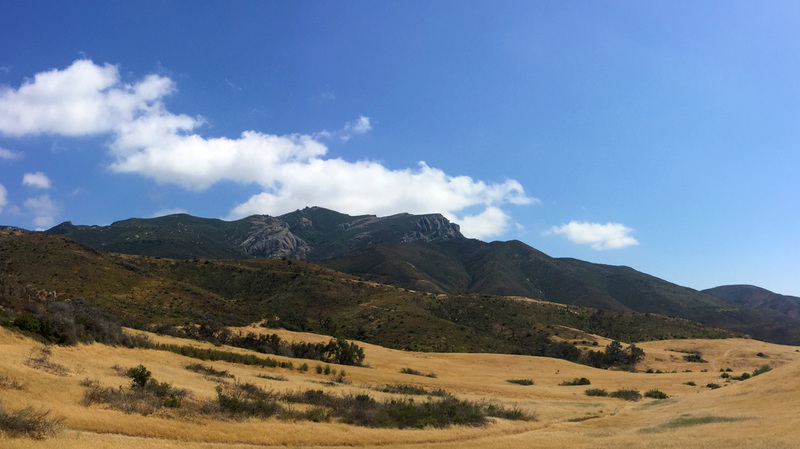 Once at the top, you continue along an established trail, following the crests, and then looping back around the Danielson Ranch Monument, eventually joining up again with the Old Boney Trail, retracing your steps back to the trailhead. Today's goal: to stand on that distant peak. View from the top, looking over the ledge. More hikes to come, check back soon.